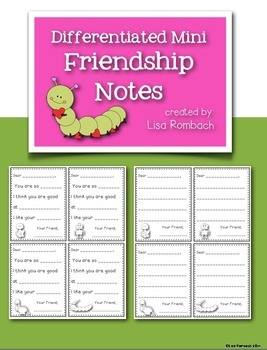 Students can write short friendship notes to each other a few days before Valentine's day (or any time of the year) with my differentiated friendship notes! I created these notes for my students to use a few days before our Valentine's exchange (we set our bags out a few days early so they can slip the notes right into the Valentine bag). However, you could use these notes any time of the year. There are 4 note cards on each page (each has a different graphic). There are 2 pages of note cards. The first set has lines. The second set has cloze sentences. I hope your students will have fun writing friendship notes (my version of love notes designed for primary students)! Click the titles below to see some other products in my store!